Orontes was built for the Orient Line by Vickers Armstrong, of Barrow. Launched in February 1929, she made several cruises over the summer months before entering Orient's London-Brisbane service on 26 October of that year. 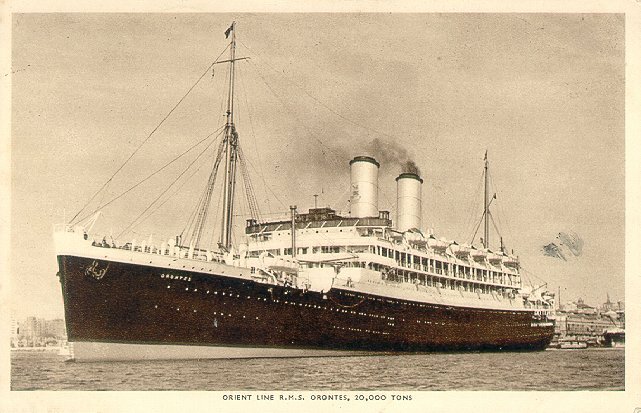 She served as a troop transport from 1940 until 1947, taking part in the North Africa campaign in 1942 and the invasion of Sicily in 1943, and transporting troops to the Pacific in 1945. She was returned to her owner in 1947, and after being refitted by Thornycraft of Southampton, returned to Orient service with a London to Sydney sailing on 17 June 1948. Orontes was scrapped in 1962.